Free Cell as it appeared in the original 1978 version for the PLATO computer system. 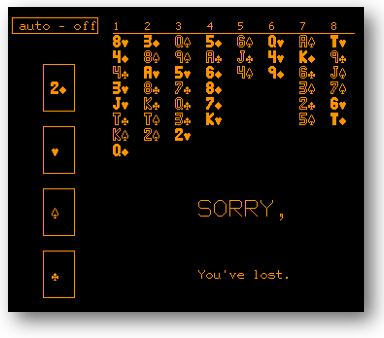 Free Cell (sometimes written Freecell) has some similarities with popular solitaire game Klondike. But unlike Klondike, a key feature are a number of "free cells" that the player uses to help them organise cards. Free Cell is slightly unusual in that it originally became popular as a computer game rather than having originated as a physical card game (except by its author and similar existing games that no doubt inspired its invention!). Free Cell is almost always solvable (unlike many other solitaire games) if the player makes their moves wisely. Nowadays, Free Cell owes its notoriety to its inclusion as a freebie in the Windows operating system. 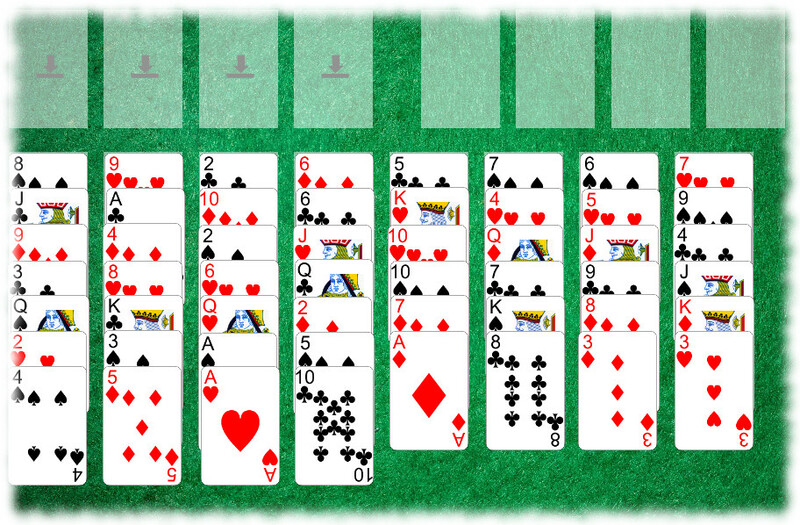 The version included in Solitaire Whizz for iPad is the version most popularly played and implemented nowadays, and what in the original 1978 version was the classic or default version. However, it is worth noting that the configuration of the original 1970s version was less fixed, allowing between 4 and 10 columns and between 1 and 10 cells. If you haven't yet downloaded the app, click here to get Solitaire Whizz Compendium for iPad, which includes the version of FreeCell (Free Cell) described here. The aim, as with Klondike and other solitaire games, is to build all cards on to the foundation piles, one pile per suit. As the Aces become available, build them on to the foundations, followed by the corresponding 2s etc. The bottom card of any foundation column is available for play at any time. An available card may be played on to a foundation (ascending order, one foundation per suit), on to an empty free cell, or on to another column. To build on to another column, you must do so in downward sequence, alternating red/black as in other games such as Klondike and Yukon. Whole sequences of cards may also be moved from one column to another. Cards on the 'free cells' are always available for play, either on to a foundation or bottom of a column in the tableau. Therefore, the free cells provide an important way to organise cards as you are building sequences and prevent you from getting 'stuck'. Empty columns may be filled with any card or sequence. Free Cell differs from various other games in that all cards are face up at the start of the game and therefore all of the 'information' for completing the game is available from the outset. Nearly all Free Cell games are solvable if played judiciously. As in Klondike solitaire and other solitaire games, when playing Free Cell it is important to free up the aces and start the foundations as soon as possible. Try to use the 'cells' as a temporary aid, moving one or two cards to an empty cell when you have a clear idea of which sequence or foundation this will help you to build on. Trying to free up a column or two early on can also be a help, as an empty column can effectively be used as an additional free cell.